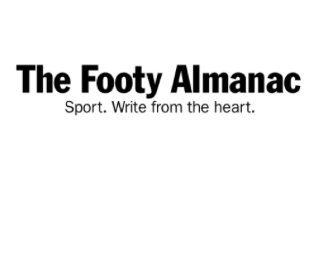 Almanac Footy History – Goals, behinds and points of difference. I’ve never had any sympathy for people who think maths is inhuman: to me, that’s its greatest virtue. Let’s face it, people – even the best of them – are occasionally unreliable, and while shared fallibility is something I can sympathise with, if it’s perfection you’re looking for I know what my choice between those binaries would be. Every time. You don’t have to be a professional mathematician – I’m not – to appreciate the sublimity of the spheres (to say nothing of the rectangles, rhombuses and parallelograms). When it comes to the ovoid shape of the ball, and the unpredictability of its bounce, you don’t have to be au fait with Boolean logic to spot the fact that the element they add to the game is chance; and that you can rely on chance over time: it’s nothing like dumb luck. For most of the season I just watch the game and enjoy. Come September, my interest deepens, I feel the shifts of fortune more keenly and I begin looking at history, recent and long-term, to see – amid this welter of unpredictabilities, what outcomes are more likely than others. So on this Grand Final Eve, I mined the rich lode of footy facts that is the AFL Tables website (www.afl.tables.com/) to explore three questions that were intriguing me. One: what are the chances (yes, I choose the word deliberately, meaning the probability as demonstrated over time) of a comeback win by a team that’s trailing with just a quarter left to play? History must surely have a suggestion or two when the Grand Final’s between two sides neither of which has been dominant in their recent clashes? Two: Is kicking for goal really one department of the game that has shown no improvement, as David Parkin, other respectable long-time observers of the game and the usual chorus of moaning fogeys have been heard to lament? Three: Given that, ever since the flood (Eade’s not Noah’s), the fast-flowing style of forward play for which our game was once renowned has been swamped by defensive tactics, is it any longer valid to describe ‘AFL’ as a high-scoring game? 1. Going back to the first Grand Final in 1898 – they didn’t have one in the VFL’s inaugural year of ’97 – there have been only 11 occasions in those 121 seasons when a grand finalist behind at three-quarter time ended up winning the flag. (Fitzroy itself managed to pull this off in 1899, coming from 7 points down to pip Essendon by 1 point.) So, history suggests the odds of that happening, put neatly, are 1:11. Four times in the 12 decades of Grand Finals, 20 or so years have gone by without a triumphant final-quarter resurrection but – amazingly – it happened three years in a row (1969, 1970, 1971). The comeback trio were, respectively, Richmond (vs. Carlton), Carlton (vs. Collingwood) and Hawthorn (vs. St Kilda, broke my 17-year-old heart, it did). Recalling those 1:11 odds, my schoolboy maths tells me the chance of that particular trifecta coming home in the first 121 years of competition are also 1:11. It’s only supposed to happen once every 11-cubed (that is 1331) years. So don’t hold your breath for that type of ‘threepeat’ (a word much used in 2015 but scarcely sighted since). The biggest successful comeback from a turn-for-home deficit on the only day of the year that counts was 23 points, the margin by which Essendon was lagging in 1984 before a 9 goal-6 last quarter left the Hawks 4 goals in their slipstream. Perhaps it was cosmic payback for the Saints’ loss to the Hawks after being 20 points ahead in ’71 (but, if so, the universe appears intent on using up its full 13-century span to restore equilibrium in a way I can actually cheer about. I can’t wait for the 33rd century!). The heartbreak factor, of course, hits some clubs harder than other. The Saints’ premiership hopes have been cruelled in this fashion twice – again in 2009, the most recent instance of the phenomenon we’re looking at – but we’re not the only twice-cursed team. It happened to the Blues in 1921 and, as mentioned, ’69; and Essendon in 1943 and ’47. So why is it worse for St Kilda? The other two clubs have 16 pieces of silverware apiece to pour their salty tears into. But the greatest victim, as you would expect, has been Collingwood, ahead in three Grannies it went on to lose – those of 1918, ’70 and ’81. 2018 narrowly escaped being the fourth ignominious item in this series only because the scores were level at the final break- as they were in 1937, when Collingwood went on to lose that day to a resurgent Geelong. 2. One of the most fascinating stats on the AFL Tables site is the total number of goals and points kicked for every year since 1897. As James Coventry points out in the opening chapter of his new book Footballistics, modern team at our sport’s highest level have been considerably more accurate than those prior to about 1980. The data bear this out with stunning clarity. Of all scoring shots in 1897 (not shots were the kicker was aiming to score, mind, but those that resulted in a score), just 36% – barely one in three – were goals. Every few seasons after that a new peak of accuracy was attained but as late as one record-breaking season, 1938 – after 40 years of plugging away – there were still fewer goals than points scored (49.2%: 50.8%). For the next 30 years goalkicking actually went backwards – well, not literally: follow me here – and then, in 1969, Man landed on the Moon AND 50.14% of all scores were goals. One small step for a man, one helluva long run-up for footykind! It can’t have been entirely coincidence that Hudson, Wade and McKenna were near their peak that year. with the proportion of goals to all scores rising to 51.63%. If you think goalkicking standards are dropping now, you’re partly right (depending how far back you want to go): with nine of the ten seasons behind us in this decade that dare not speak its name (the Tens? Teens? ), the rate has slipped back to 52.92%, but that’s still historically high. The last year there were more points scored than goals was 1981 – when Malcolm Fraser has just won his third election victory; Boy George’s Culture Club was considered a danger to the collective moral fibre; and ‘wireless’ was what grandparents could remember being the ‘cat’s whisker’, not a signal from the future. In the 84 years of competition prior to that, goals exceeded points in only seven years, and all of them since Apollo XI. The most accurate year and – true millennials are going to love this – the only one in which more than 55% of scores were goals, was AD 2000. Heading the queue of those who can take great credit for this for must be Matthew Lloyd. They scoffed at his preparatory habit of picking up tufts of stadium turf but he booted 109.60 that year (positively skew-whiff compared to his 2001 tally of 105.36). And so to 3: can we still boast that Aussie Rules is a high-scoring spectacle? Semanticists will see at once that this is a compound question. So, 2, 4, 6, 8, let’s disambiguate: is it a spectacle? No one who saw the 2018 Grand Final – or followed the game throughout the season and care to look once more at the final quarter of the Geelong-Melbourne clash in Round 18, when Tom Hawkins’ tally of seven on his 30th birthday contributed to one of the greatest last-quarter comebacks of all time – could deny its spectacular status. One metric for deciding whether a game is high-scoring would be whether at least one side kicks 100 points or more. I haven’t seen any stats to show whether that is less common than it used to be (you just feel that a number-crunching exercise looking at that would conclude that it is). Three-quarters of a century ago, in 1943, the average was 84 points, typical of its time. It would seem cruel to point out that those who would have been the best goalsneaks of their generation were at that point shooting straight in a nobler cause (so I won’t – but one can only surmise how unflattering the comparison would be to today’s crop of footballers if Hitler hadn’t sent his Panzers into Poland). From 1950 until the mid-’60s was a low-scoring era, the average plunging into the 70s for most of those years. From 1970-77, and again throughout the 1990s, it was 90-something points, which should give today’s coaches pause for thought. But the true golden-boot epoch was from 1978-93 inclusive, when scores averaged 100 points or more 16 years in a row, peaking in 1982 at a colossal 112 points (just shy of 17 goals) a game. As they say, statistics don’t lie (well, not very convincingly anyway – one reason Trump doesn’t cite them). Impressions are interesting (remember the ‘biggest’ inauguration crowd ever?) but no match for mathematical certainty. Exactly a century ago, in season 1918, the average team score for a game was 56 points, just half of what it would be 18 years from the end of the century. So I say let AFL House bring in all the rule changes it can think up to ease congestion. May the flood be ordered to recede (or recede to order). May the goal squares meet in the centre square and the best polygon win. But if this defensive trend continues we may yet see the future more closely resembling the past than is healthy for any sport, or any society, that prides itself on being progressive in so many ways. That progress even exists, that we are going forward, faster, higher – and straighter – than ever before may be one of the last illusions to drop away. We fans don’t need to check history’s score sheet to know what we’re seeing. The evidence of our eyes is undeniable. But we have the maths to back us up. Very interesting Ken. Mathematics can be used for niceness and for evil, as Agent 86 would say. Although apparently mathematically regressive, scoring less than ‘basketball-like numbers’ (and not having a 30 metre long goal square or forward zones) hardly diminished the 2018 Grand Final as a spectacle. Scoring for scoring sake seems to be a somewhat capitalist desire, without any consideration of all the other aspects of the AFL game that make it so enjoyable. Could we have a look at the number of rule changes over various periods and correlate that to the desired higher scoring and/or increased enjoyment outcomes? Judging by your numbers, I have an inkling of the answer already. Remember, the AFL hierarchy only want higher scores so they can fit more ads into a telecast. Personally, I prefer a hard tight contest with passages of openness than free-flow, no responsibility, games even if my team is on the wrong end of it at the final siren.